Widely known as the Happiest Place on Earth, Disneyland is a place that all Americans cherish and adore. There are many facts about this magical place that are well known to the world – the mouse ears, the churros, the rides, and the parades included. There is, however, much you may not know. From rumors of secret areas to historical park facts, there is no shortage of surprising information about the Magical Kingdom – so follow along with these ten crazy facts you never knew about Disneyland! When Disneyland opened it’s doors in 1955, they required patrons to pay not only for the general admission, but for individual ride tickets as well. The rides were broken into categories based on popularity, ranging from an A-ticket to an E-ticket. It wasn’t until 1982 when Disney decided to do away with this method and stick to one general admission price in order to keep up with their competitors. Anyone who has waited in line for the Haunted Mansion has admired every creepy detail of the impressive building looming above them. In reality, this building is simply a decoration and the entire ride is below ground. The very beginning of the ride features a “stretching elevator” taking you down, and as you walk through the hall of portraits you are actually directly underneath the Disneyland Railroad. Tomorrowland is built in a way to showcase an optimistic view of humanity’s future. As such, Disney instructed his landscapers to make sure that every plant in Tomorrowland was edible. In Disney’s version of what the future may look like, humanity has found a way to make the most of every resource. Modern Disneyland is scheduled to be open 365 days a year (in it’s early years, it was closed Monday and Tuesdays during the off season). Since then, there have only been three days in which the entire park has closed it’s doors to guests. These days are: 1) the national day of mourning post JFK’s assassination; 2) after the Northridge Earthquake in 1994 (for safety inspections); and 3) on 9/11. Some days, there are more important priorities than rides and churros. The Indiana Jones ride is done so well, it really feels as though you’ve been transported into the movie, right? This isn’t surprising once you’ve learned there there are actually several props featured on the ride that really are from the set. Among others, a prominent mine cart as well as a Mercedes truck both were used on set. The Matterhorn was not only the first thrill attraction built for the park, it was also the first tubular steel roller coaster ever built. In the upper part of the mountain exists a half-court basketball court meant for employees only. There are plenty of rumors swirling about as to why Disney had this facility installed, but most have been disproven, leading fans to believe it was simply an area for employees to unwind. The 100-200 feral cats that now call Disneyland home may have originally been attracted to the park for the abundance of food – both from the guests and the rats. Disneyland saw its cat population as an opportunity instead of a nuisance, and began feeding, vaccinating, neutering, and tagging them. The cats are now the park’s first line of defense against mice and rats, leaving it’s grounds a much cleaner place. This iconic boat ride was once planned to be simply a walk-through wax museum as a part of a larger complex called the “Blue Bayou Mart”. Disney eventually changed his mind and made the ride boat orientated. The decorations also originally included real human skeletons, which were on loan from UCLA. It is said that there is still one human skull still used as decoration. 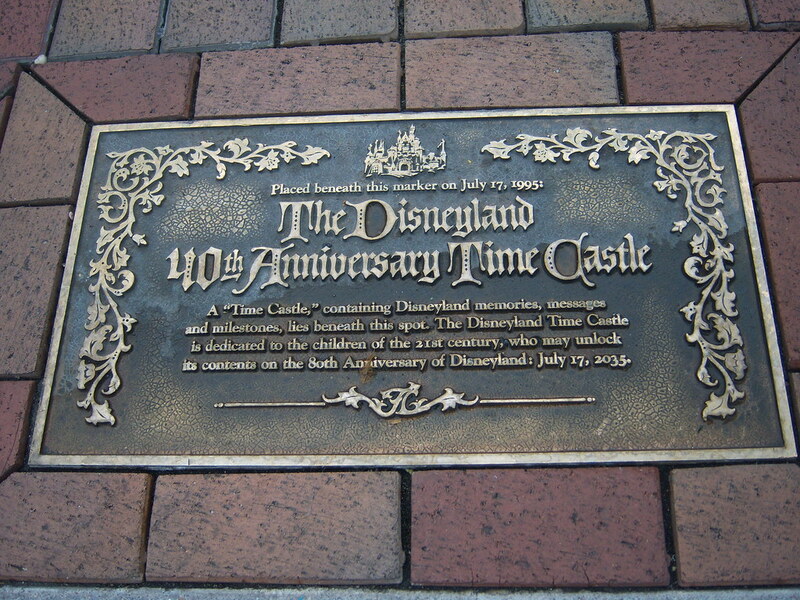 In 1955, Disney buried a time capsule in Sleeping Beauty’s castle. No one is certain as to its contents, and we will not know until it is opened in 2035 – the park’s 80th anniversary. Cleanliness of the grounds is of huge concern to Disneyland employees. In fact, the park has trash cans available every 30 feet, and employees are required to pick up any trash they may see lying around. This is why you will never see gum or shelled peanuts for sale in the park. Both of these items have the ability to create a mess, so they attempt to avoid the problem before it happens. We may never know everything about Disneyland, and it almost seems as though that’s how Walt would have wanted it. As it’s creator, he loved no place greater than Disneyland, and it was his great joy to share it with the world. Mysteries and all, Disneyland will continue to be a magical place for generations to come.